Random House Books for Young Readers, 9780394896953, 48pp. It is one of the worst storms ever - the snow has not stopped for days and it is 30 degrees below zero. But somehow Balto must get through. He is the lead dog of his sled team. And he is carrying medicine to sick children miles away in Nome, Alaska. He is their only hope. 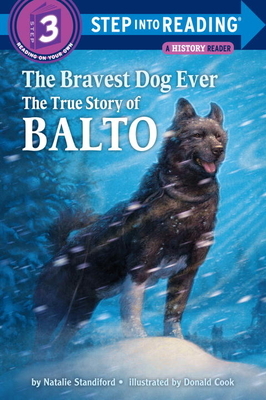 Can Balto find his way through the terrible storm? Find out in this exciting true story! Natalie Standiford was born and raised in Baltimore, Maryland, but now lives in New York City. She plays bass in the rock bands Tiger Beat (featuring fellow YA writers Libba Bray, Dan Ehrenhaft, and Barney Miller) and Ruffian. Find out more at her web site: www.nataliestandiford.com. "A compelling account, told in easy-to-read format, of a sled dog who led his team over 53 miles of Alaska wilderness to deliver medicine during an outbreak of diphtheria in 1925. Cook's softly colored illustrations enhance the drama of a proud and heroic story that young readers are sure to enjoy." --School Library Journal.